OK Ralph, this one is for you. I did my first at-home marquetry project the other day, trying to put what I learned in the class at the American School of French Marquetry in September. There are a lot of little processes involved, and I know I’m going to have to repeat them a few times (and make mistakes) to really learn them. That doesn’t mean I’m going to like screwing up though. At the class I struggled with sawing, I just couldn’t get smooth cuts and follow the line. My first cuts on my Chevy were very rewarding. The cuts weren’t perfect but it was the difference between missing your exit on the highway and getting on the freeway going the wrong way. I had two significant problems once the parts were sawn out. The main one was with assembling the parts. The process as Patrick teaches it is to assemble the picture face down in a bed of hot hide glue (HHG) on an “assembly board”. The assembly board is a piece of wood with a special brown paper stretched over the surface and glued at the edges. The assembly process is to lay the background face down into the HHG, then fill in all of the puzzle pieces before the glue cools. After that a mastic made of HHG and fine sanding dust is packed into the seams. 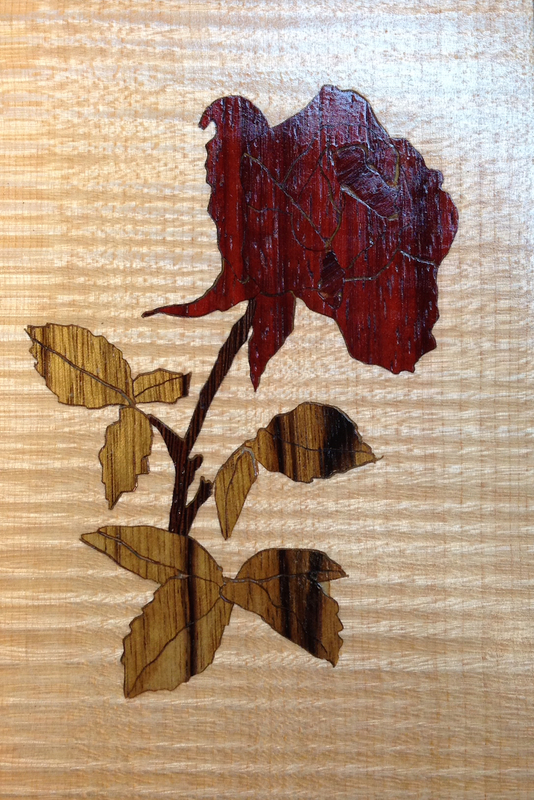 To install the marquetry onto a project it’s cut loose from the assembly board and glued to the project paper side up. So when I started the assembly I smeared HHG on my assembly board, positioned the background veneer and before I completely pressed it into place the glue was setting up. I got a couple of leaves in place, after that I had to re-apply a little glue with my finger before I put each part in place. The stress of trying to assembly it lead to losing a piece the size of a gnat’s eyelash. And later I realized that I’d assembled it finished side up by mistake. Not willing to leave an honest mistake to stand on it’s own, I clamped the project and left it to dry overnight. When I unclamped it, it pulled a chunk of veneer out (I should have used waxed paper or plastic on my caul). I wasn’t happy, but chalked it up to learning. And I threw away the last three little bits of the picture I hadn’t installed as the intervening. Now I really didn’t want to deal with this. But I decided I was curious to see what it would have looked like. 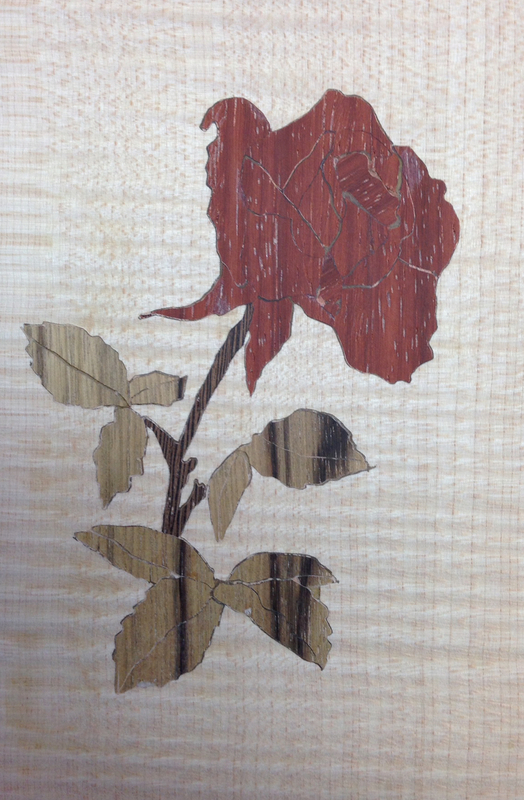 So I made a rubbing of the missing areas in the assembled marquetry. The larger one should actually have four separate shaped fit into it, but in the interests of putting the rose out of my misery I decided to fill it with one patch. I had to dig the hard, cold glue out of the edges, but I got two patches cut, fit (ish) and glued into place. Assembled marquetry on the left, the left over packet on the right. I’ve glued my tracings of the holes onto the packet to cut out. I should have cleaned the dried glue up first and the tracing wasn’t completely accurate…another lesson hiding in here. Once the patches were glued in place I sanded the newsprint off the surface (the design is still on the assembly board) so I could see the “effect”. It’s “OK”. There are a dozen little problems that bug me, but it’s encouraging enough that I think I’ll eventually be able to bumble my way through using these techniques on a real project. So, what’s the report here? First, the repair took about six hours. Five and a half hours of sulking followed by 30 minutes of tracing, sawing, gluing, sanding and shellacing. Go figure. Second, setting aside the screw-up with how the part was oriented, I intentionally skipped two steps. I didn’t do the sand shading on the parts. We didn’t cover that in the class as we were doing designs that didn’t require it. I also didn’t have sand and wanted to see the design finished. 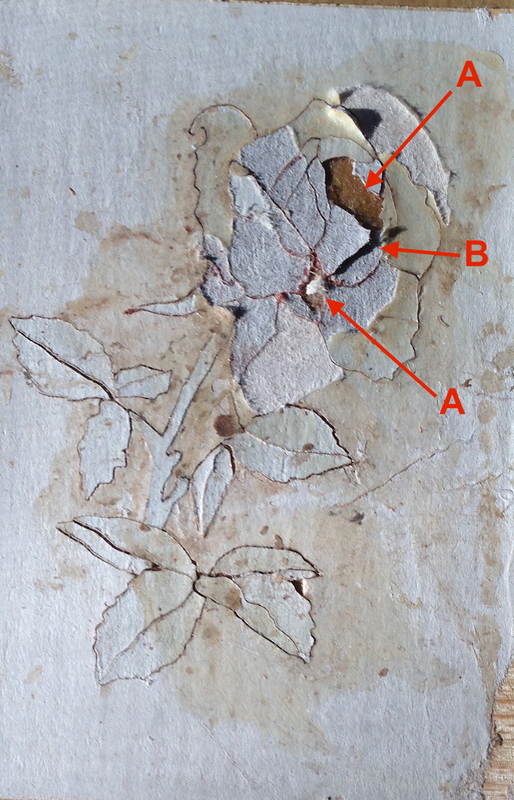 There are 21 individual pieces in the rose (just the flower – not the stem or leaves). This would be much more dramatic if it was sand shaded. Ditto on the leaves. I also left out the “mastic fill” step in the process, mostly because I knew this was as far as I was taking this effort, but also because due to the assembly problems a lot of the gaps between pieces got filled with glue already. It’s 35 degrees outside, I don’t think I can assemble this in HHG until the ambient temperature is closer to 70. I’m going to repeat this project adding in the skipped steps and using an intermediate assembly technique with blue tape. I’m slowly using up my veneer sample pack, I’ll buy some thicker stuff when I’m ready to do a real project. I think another practice project or two and I’ll be ready for something real. This project, even with the mistakes, looks ok. As long as you in a dimly lit room with a lot of smoke in the air. “Finished” project with a couple of coats of clear shellac. I gotta give you credit Joe. If this was my first attempt, I wouldn’t have got this far. The fireplace would have seen the bits and no one else. 🙂 My shop is a little warmer than yours but not by much. When I get to the point your at I might just have to move the marquetry pieces into the living room and do the gluing there! Let’s see, I’ve probably got a couple of months to get to the point you’re at, so I’ll to start work on the sales pitch. You don’t need dim light or smoke. I’m impressed with your mistake as it is. I know that I couldn’t do what you just did and i searched and can’t see any wandering lines anywhere.. If it was me, I would frame this and keep it in the shop by the chevy.